Introducing the Tru-Form Pro by Adesso. Its contoured, split key design for ergonomic comfort with a Built in Touchpad acts as your mouse. Touchpad includes Left and Right mouse buttons and built-in wrist support. Integrated touchpad eliminates the need for a mouse and saves valuable desk space. 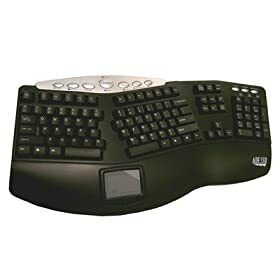 The Adesso Tru-Form Pro has multimedia keys that make this keyboard a comfortable, multi-featured keyboard that combines a host of Windows and Multimedia keys in a comfortable ergonomic design.